A study of over four million instagram posts over a span of four years has concluded that BMW is the most popular automotive brand photographed on the social imaging app Instagram - an app mostly used by Vine users and celebrity public relations managers. The Bavarian brand blitzed first place, with over 700,000 posts dominating in states including Maine (grumpy retirees), Florida (happy retirees), and California (celebrity retirees). 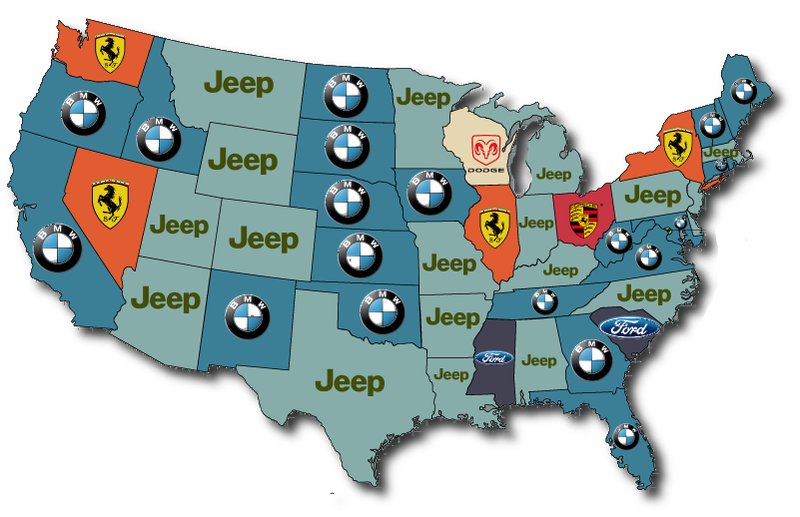 Jeep came in second place, dominating all the places you’d expect them to - in all the square-shaped states. Congratulations American automakers, you are losing. If this were a game of Sid Meier’s Civilization, you might as well say goodbye to the Louisiana Purchase. It looks as if BMW invaded from every border except Mexico. Ferrari tidied up in 3rd, being most popular in New York, Illinois, Nevada (because Ferraris have a little horse? I’m not sure), and Washington state. Washington D.C., birthplace of America, favored Audi - a boring brand with products that are difficult to distinguish from one another and sells you what you could get cheaper elsewhere at a ridiculously marked up price. You can see why it’s a hit there. The research focused on numbers, which is why Lamborghini beat out Ford even though the American manufacturer dominated more states. The top ten finished out with Porsche in fourth, Nissan, Toyota, Lamborghini, Ford, Dodge, and Audi at tenth. The Auto Insurance Center, who set up the study, goes into further detail on their site, which includes interesting details like 606 Instagram posts per every one Lamborghini sold in America, as well as breaking down favorites per capita and other fun statistics with plenty of pretty graphs and diagrams for you to look at. GM doesn’t make the national list until 12th place with Chevy, of which a majority of Instagram posts likely feature a lifted truck on big tires with those annoyingly bright purple headlights. It appears the only person seriously lusting after GM online is Sergio Marchionne. Show us your car selfies below.